BEATEN, BATTERED AND DAMNED NEAR BROKEN, with a bounty on his head so large he’s tempted to turn himself in, the Black Thorn finds himself on trial for the crime of being him. Despite the impending probability of death he has but one thought on his mind; taking revenge against the Arbiter who took his eye. 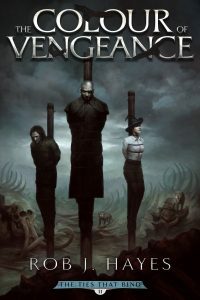 The Colour of Vengeance can be purchased from Amazon. High acclaim: The Colour of Vengeance features in Fantasy Book Critic’s top reads of 2013. See the lists at the Fantasy Book Critic website.